As I seek to make healthy and delicious meals for my family, I want to share some of the more successful recipes. My goal is clean eating (using ingredients that are as close to its original form as possible), which means minimizing prepackaged, precooked, preprepared foods and using as many fresh ingredients as possible. I also want variety, which provides more of the nutrients we need, more fruits and vegetables, and healthier proteins (poultry, fish, legumes, etc). Of course, this will make it a challenge in trying to keep the food budget down (seafood is not cheap!). It will also be a challenge with a teenager still at home. From previous and current experience, they tend to want processed foods much more than healthy fare. The challenges, however, will keep things interesting. So tonight I tried a vegetarian recipe that included fennel (a first for me – I had to look it up to see what it was), mint and goat cheese, among other things. Let’s just say that I’m not posting the recipe because it wasn’t much of a hit with the menfolk. It wasn’t quite as bad as the beets and gorgonzola cheese fiasco (which stunk up the house) a few years ago, but definitely not the fried chicken tenders and mashed potatoes with cream gravy the guys were wanting to make. Ah well. 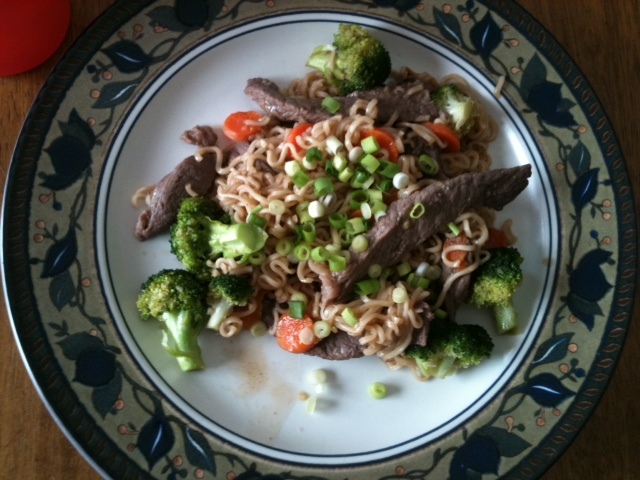 ©This Asian Beef Noodle dish was a hit even with my 13 year old son. All made with fresh ingredients. Add garlic and ginger to skillet, stir fry 30 seconds. Add noodles, broken into pieces, broccoli, carrots, and seasoning packet from ramen noodles. Bring to boil, reduc heat. Simmer 3 minutes or until noodles are tender and most of the liquid is absorbed. Return beef to skillet, heat through. 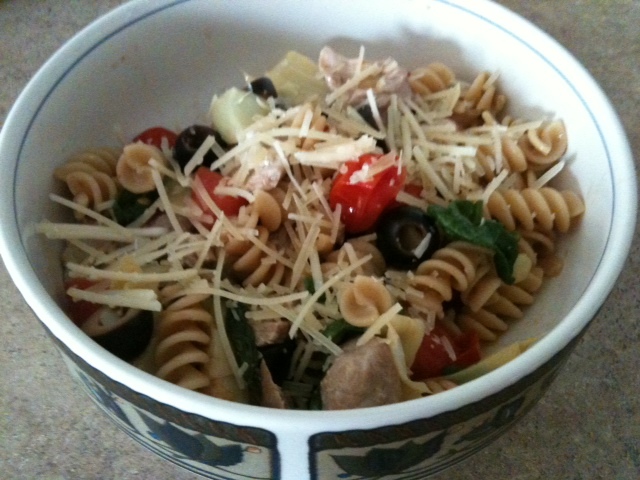 ©Tonight I made Tuna Pasta with Olives & Artichokes with fresh steaks. Heat the remaining 3 tablespoons oil in a large skillet over medium heat. Add artichoke hearts, olives, garlic and the remaining rosemary. Cook, stirring, until the garlic is just beginning to brown, 3 to 4 minutes. Add tomatoes and wine; bring to a boil and cook, stirring occasionally, until the tomatoes are broken down and the wine has reduced slightly, about 3 minutes more. Wilt spinach in a seperate pan and stir in with the pasta, tuna pieces, lemon juice and the remaining 1/4 teaspoon salt; cook until heated through, 1 to 2 minutes. Garnish with basil (or parsley) and parmesan, if desired. In a small bowl, combine the cornstarch, brown sugar, broth and soy sauce until smooth; set aside. In a large skillet or wok, stir-fry chicken in 2 tablespoons oil until no longer pink. Remove and keep warm. In the same skillet, stir-fry the mushrooms, green pepper, onions and ginger in remaining oil until green pepper is crisp-tender, about 5 minutes. 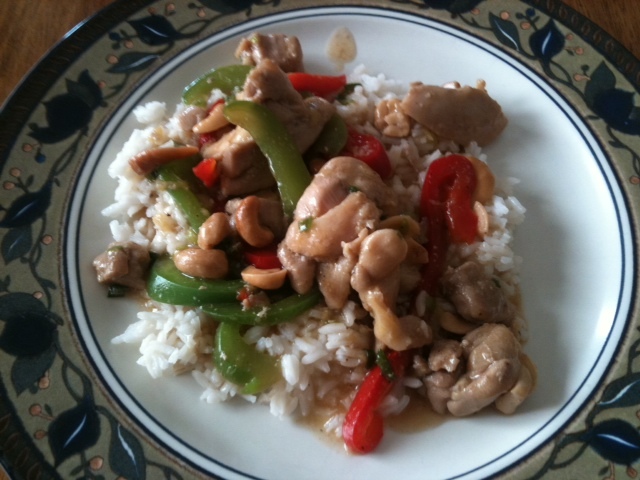 Stir in the chicken, water chestnuts and cashews; heat through. Stir broth mixture and add to the pan. Bring to a boil; cook and stir for 1-2 minutes or until thickened. Serve with rice. Nutrition Facts: 1 serving (1 each) equals 362 calories, 20 g fat (4 g saturated fat), 63 mg cholesterol, 689 mg sodium, 17 g carbohydrate, 3 g fiber, 29 g protein.